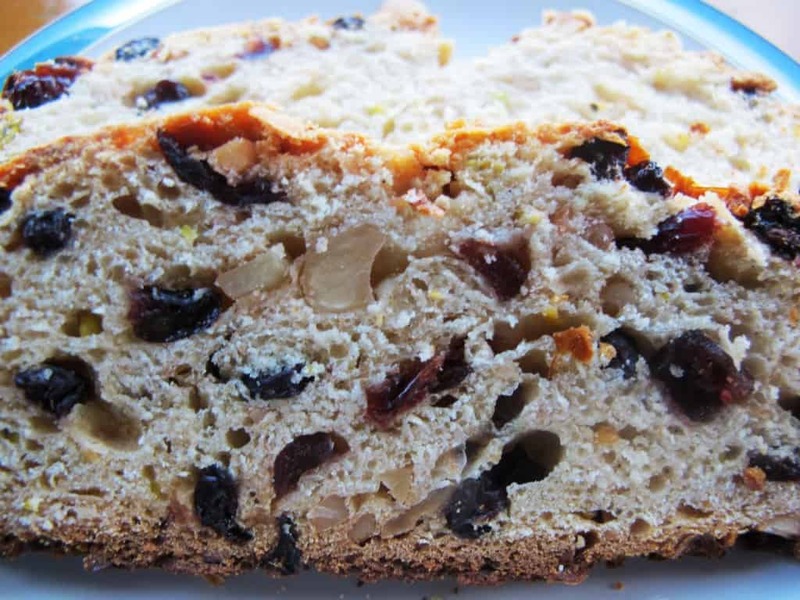 The traditional German Christmas bread called Stollen is a rich, sweet fruit bread made with butter, milk, spices and rum-soaked dried fruit and nuts. 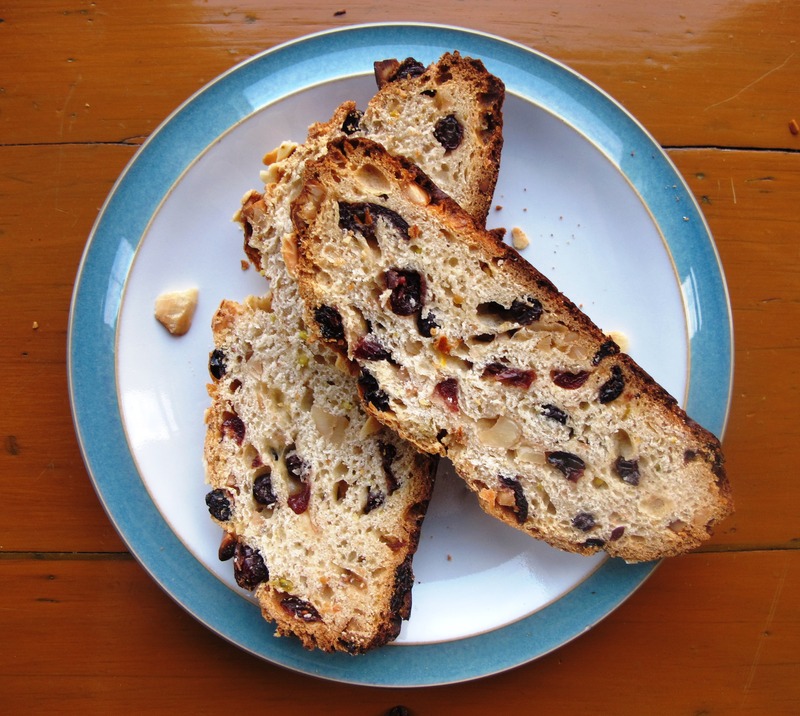 Here I present my very own version of Xmas Stollen – my sourdough Stollen recipe for all you adventurous bakers out there. To provide some background: I’ve always wanted to be a Xmas Stollen lover. However, it usually contains a few ingredients I’m not really a huge fan of such as candied orange & citrus peel and marzipan. Heaps of butter and sugar are normally used to preserve the bread for weeks (the typical proportions for traditional German Christmas Stollen according to the Dresdner Stollen Association are a minimum of 50% butter and 65% golden raisins when compared to flour weight). Reduced fat and sugar content. A thick layer of butter and icing sugar is usually applied as topping but I’m opting for egg wash and almond flakes instead. Note that all the ingredients in this recipe should be at room temperature, so warm the milk slightly if it’s just out of the fridge. This recipe will give you approx. 20 slices of delicious Stollen. Use Austrian Stroh rum for a deliciously authentic rum-flavour. I've added a little bit of yeast into the recipe to lift the rather heavy dough. Mix the dried fruit and chopped almonds with the rum, cover with cling film and leave overnight. This hydrates everything slightly and ensures that the fruit and nuts do not soak up too much liquid from the dough. It’s really important to use good quality ingredients here as the flavours will really unfold in the baked Christmas Stollen and there is a remarkable difference in the taste. 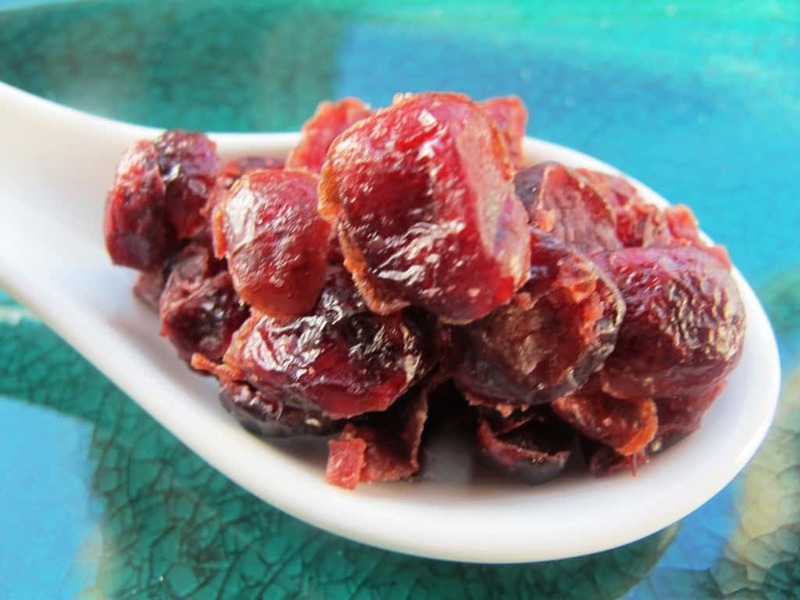 I’ve used organic dried fruit (organic medium currants and organic dried cranberries) and almonds from Real Foods which are just perfect. The currants add lovely bursts of intense flavour and are high in antioxidants and vitamins while the cranberries give the dough a delicious sweetness while being a great source of vitamin C and dietary fibre. Prepare the sourdough by mixing the above ingredients together and covering the bowl with cling film. 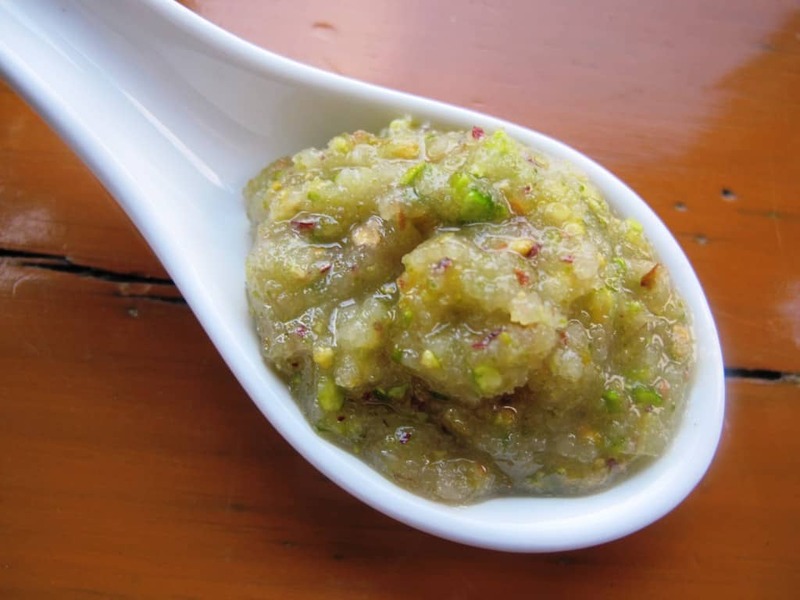 Prepare the almond and pistachio paste, cover with cling film and keep in the fridge overnight. The paste should be nice and smooth, not too wet or dry. 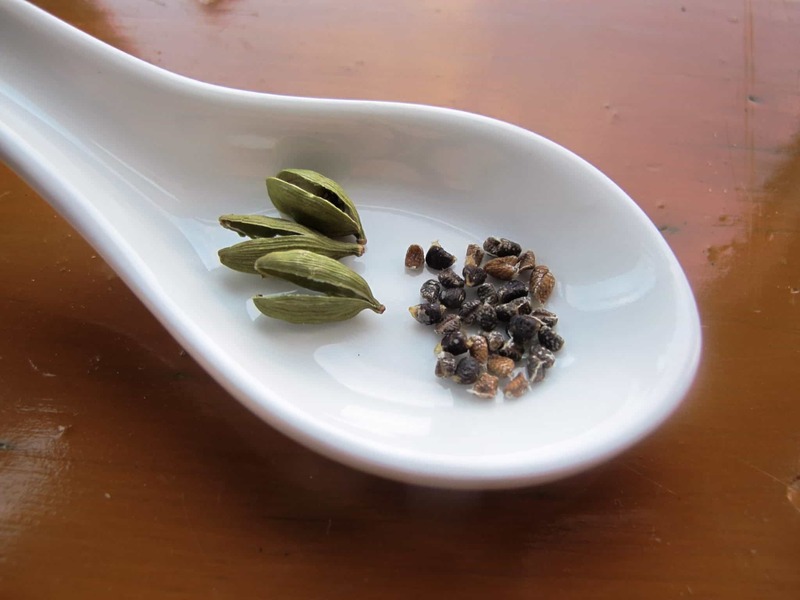 Crack the shell of the cardamom pods with a knife handle and remove the seeds. Give the seeds a quick grind with a pestle and mortar. Don’t use ground cardamom as it just doesn't have the same fragrant, fresh flavour. I’ve used organic cardamom pods from Real Foods which are super aromatic and perfect for Stollen. Knead for 10 mins to develop a smooth and satiny dough. It’ll be a little sticky but that’s fine. 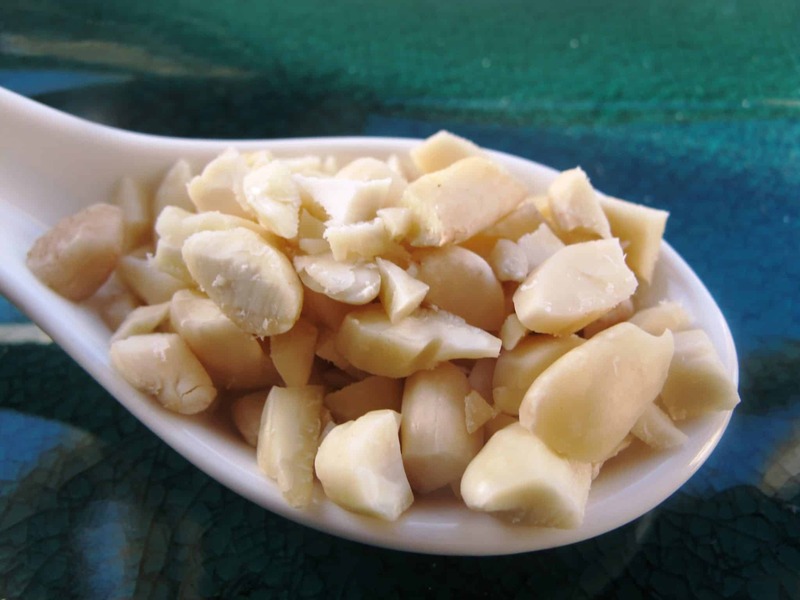 Then work in the fruits, nuts, lemon zest and spices, distributing them as evenly as possible. Now leave the dough in a warm place, covered with a kitchen towel or cling film, until it has doubled in size (the time this takes can vary depending on the room temperature; approx. 1.5 hours, but this could take longer!). Knock the air out of the risen dough and knead for another minute or two. Shape the dough into an oval loaf (I’m not too bothered with the traditional fold). Place on a baking tray lined with baking paper and cover with a moist kitchen towel. Leave in a draught-free place for its second proof. Depending on the temperature in your kitchen, this could be done in one hour, but for me this lasted almost three. Use your finger to make a small dent in the dough. If the dent remains, the bread is ready to bake. If it disappears, the dough needs some more time. Preheat the oven to 190°C (gas mark 5). Prepare some egg wash (combine an egg and a table spoon of water and whisk together). 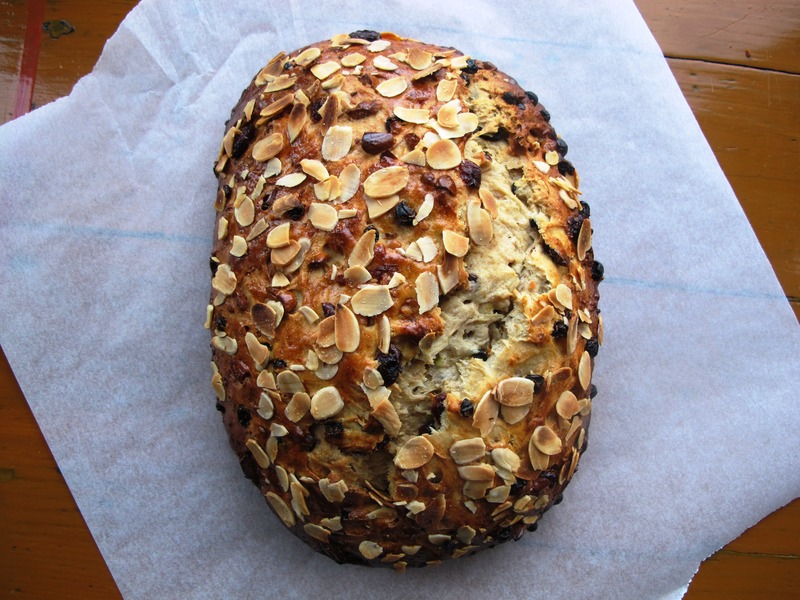 When the dough is ready, brush the Stollen with the egg wash and sprinkle with almond flakes. Bake in the oven on the lowest shelf for 1 hour 15 mins. If it browns too quickly, protect the bread by covering the top with tin foil. I do this after 25 mins initial baking time. Use a cocktail stick or skewer to check if the dough has fully baked through as you would with a cake. The internal temperature of the loaf should be 94°C, my Thermapen is proving invaluable once more! Allow it to cool on the baking sheet for about 5 minutes before lifting it onto a wire rack to finish cooling. Serve in relatively thick slices with strong coffee or tea and good quality butter. Lightly toast if you would like to heat it through. Stollen Slice with a nice crunchy crust! 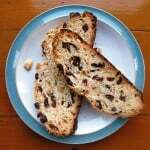 Over the last few years, I’ve started to bake Christmas Stollen to order as it keeps and ships well. If you’re interested in a homemade Stollen delivery, please just get in touch via the contact form here to order your special Christmas treat online. 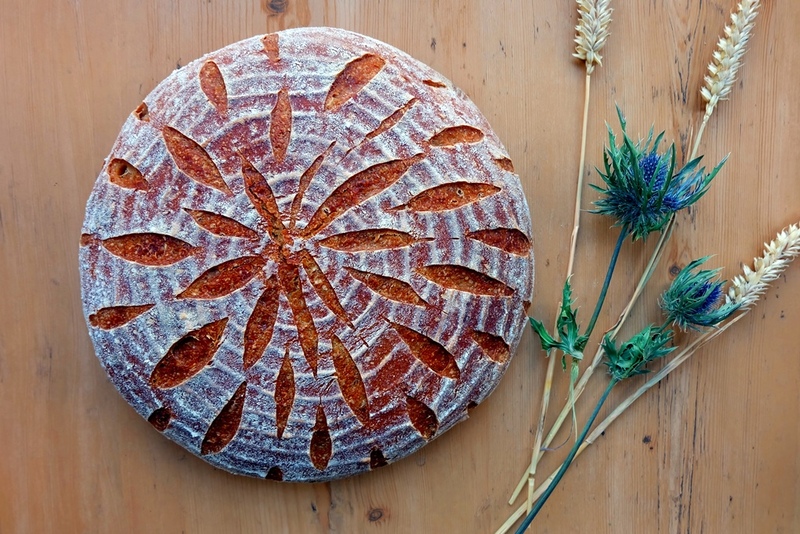 Previous PostPrevious Bread Art – Why Not!